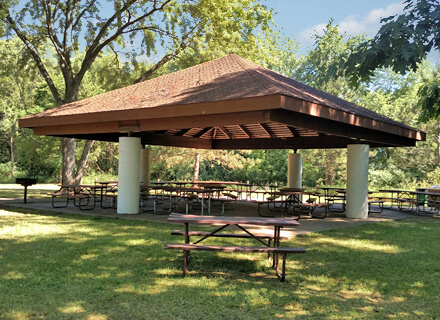 Secluded at the north end of the park, this large open-air shelter is a fantastic site for a family outing and includes close access to the disc golf course and a volleyball court. From the gatehouse, take the first left and continue across the covered bridge. Take the next left and cross the spillway. The shelter is at the end of the road.